2018 has been a great year for the US economy with output likely expanding at the fastest rate for 13 years and the unemployment rate falling to a 49 year low. There is broad-based momentum with huge tax cuts providing additional thrust over recent quarters. As such the Federal Reserve has raised its Fed funds target rate in each of the first three quarters of the year with another rate rise looking highly probable in December. After all, the economy is booming, inflation is at or above the 2% target on all the key measures and the jobs market is finally generating wage pressures. With the Fed funds target range set to end 2018 at 2.25-2.50% the Fed’s monetary policy stance is no longer be described as “accommodative”, but it remains some way off from being restrictive. As such we expect interest rate rises to continue in 2019. The US economy will face increasing headwinds as the lagged effects of higher interest rates and a stronger dollar act as a brake on activity. 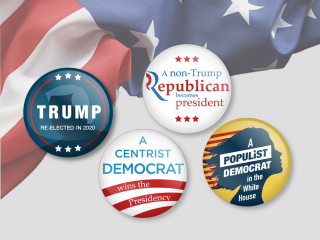 The support from the fiscal stimulus will also gradually fade with the mid-term election results limiting the chances of further tax cuts or spending increases. 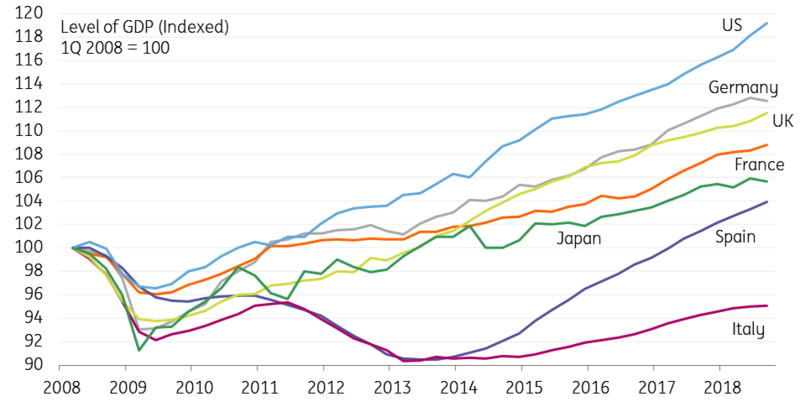 Then there is the weaker global growth outlook, with Europe and Asia seeing clear signs of slowdown while intensifying trade protectionism could exacerbate the softening trend. Recent equity market weakness underlines these concerns for 2019 growth. However, there will be some positives. Wage growth has broken above 3%YoY and we think there is more upside ahead given the tightness of the labour market. Indeed, the NFIB survey suggests that companies are finding it increasingly difficult to find labour and are consequently increasing compensation while the Federal Reserve has noted increasing competition on benefit packages including healthcare, vacation days and signing bonuses. If we are right and wages continue rising then this will support consumption while adding to medium-term inflation pressures. On balance we think growth will slow in 2019, but inflation will likely persist above target for much of the year ahead. Consequently, we favour three 25bp Federal Reserve rate rises in 2019 versus four in 2018. For the ECB, 2019 will be the year – at least attempted – next step of policy normalization. With the end of the net-QE purchases, all eyes will be on the timing of the first rate hike. However, given doubts about the strength of the Eurozone recovery and underlying inflation not gaining momentum, the ECB will take a very dovish stance, pushing the timing of a first deposit rate hike towards the end of the year. A refi-rate hike may not happen until 2020! The ECB should also try to prevent speculation about a series of rate hikes by using forward guidance on rates, and announcing that reinvestments of maturing assets will continue at least until the end of 2020. If - and it's a very big if - the British Prime Minister can defy the odds and persuade parliament to approve her Brexit deal in December, then we think this would keep the Bank on-track to hike rates in May 2019, potentially followed by a second increase in November. BoE policymakers have made it pretty clear that they want to 'get on with it' given the upward trend in wage growth. However, it looks increasingly likely that Parliament will reject the deal. This could open the door to a snap election (or maybe a referendum), although this seems a tall order given that it would require a number of Conservative MPs to back it. But if it were to happen then article 50 would almost certainly have to be extended and that would prolong the uncertainty for businesses well into next year. This could easily push the date of the next BoE rate hike back further into 2019. Without an election or referendum, then avoiding 'no deal' will boil down to whether Prime Minister can find support for her deal second time around. The EU is unlikely to be in the mood to renegotiate the bulk of the withdrawal agreement, but may be open to some tinkering in the political wording. Our base case is still that a fudge can be found that passes through Parliament and avoids 'no deal', although this might not happen until much closer to the EU exit date in March. This means that businesses and consumers are likely to grow more cautious over the winter. Again, this would push the date of the next rate hike further back into next year to let the dust settle. Finally, if the UK does fall off the cliff edge, then BoE policymakers have suggested rates could go in either direction. However, any supply-side shock would likely be coupled with a sharp hit to confidence, so we suspect the Bank will focus on growth and look through any currency-induced inflation spikes. 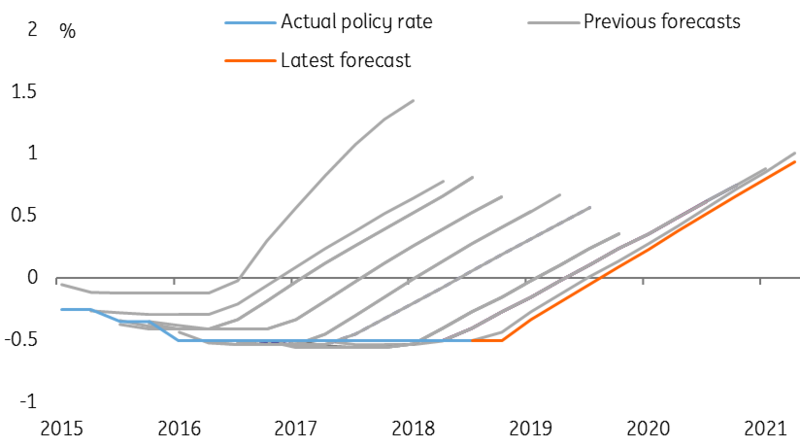 We think policy easing would be likely, although we get the sense that policymakers may wait a little longer than they did in 2016 before acting, to get more evidence on the true economic picture. The key policy objective for the Chinese central bank (PBoC) in 2019 is to help small private companies and thereby avoid a material increase in unemployment. To achieve that, we expect the central bank will cut required reserve ratios (RRR) on all banks in each quarter, two further cuts in PBoC 7-day policy rates, plus a gradual depreciation of the yuan if the trade war with the US continues to escalate. The RRR cuts will likely be between 0.5 to 1 percentage points, depending on the quantity of liquidity that small companies need. Each 1 percentage point RRR releases around CNY1.765 trillion to banks. This is the main policy tool to put downward pressure on interbank interest rates. 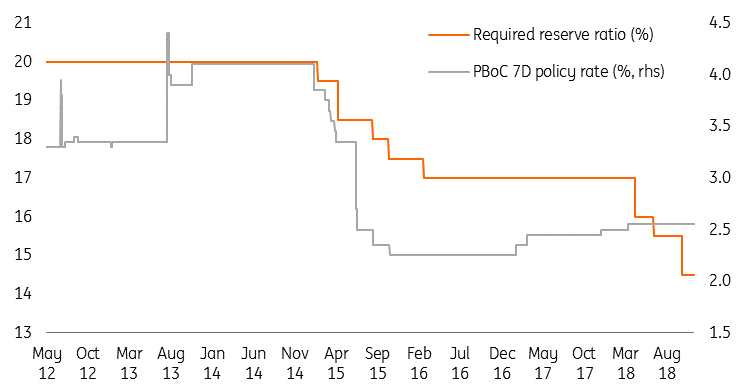 We also expect the PBoC to cut the 7-day reverse repo rate twice in 1Q19 and 3Q19 from the current 2.55% to 2.45%. A 1Q19 cut would be the first since 1Q18, which was a rate hike of 5 basis points. The extent of each cut in 2019 will only be 5 basis points as the central bank is still unsure about the interest rate transmission mechanism on the economy, and is still testing the market reaction to interest rate cuts. The PBOC will not want to surprise the market. To smooth out other liquidity needs, for example around the end of each quarter, the PBoC can inject liquidity to the interbank via Medium Term Lending Facility (MLF). For this reason, we do not expect spikes in interbank interest rates. On USDCNY, we expect the central bank will continue to favour gradual depreciation of the yuan. The exchange rate could reach 7.30 by the end of 2019 as trade war risks continue to escalate. There is very little new to add on the Bank of Japan, but a good starting point, given that Governor Kuroda has hinted that 10Y Japanese government bond (JGB) yields are the clue to the BoJ’s stance, is to note that they are sitting right on top of the official 0.1% yield. Aside from this, the main news on the economy will have little bearing on the BoJ, namely the 3Q18 contraction in GDP. As this appears to us to be an entirely weather-related effect, caused by Typhoon Jebi in September, we see no impact on the BoJ stance. Indeed, we see growth rebounding strongly in the fourth quarter of 2018 and continuing into the new year. 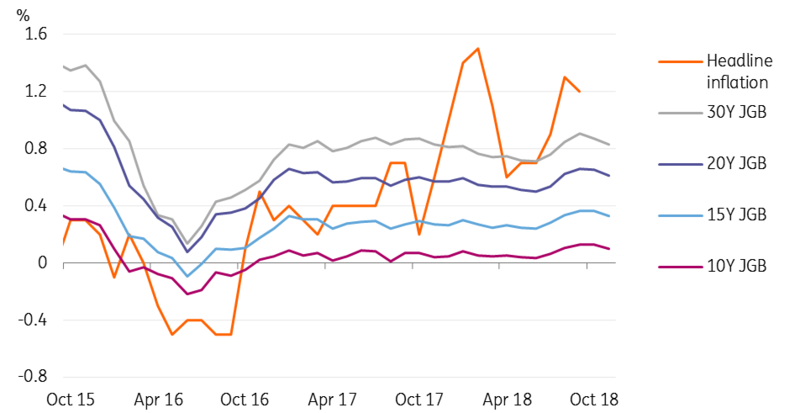 Even the usual food price spike that you might normally expect to have been affected by a typhoon of this sort could be subsumed to a large extent by the backdrop of falling oil prices. There has been a bit of controversy surrounding BoJ policy with a study of the impact of negative rates by Professor Koeda of Waseda University, which suggested that removing negative rates might actually help push up economic activity and prices. The findings match those of an ING study some years ago looking at other economies, so we are encouraged to see the academic profession in Japan join this side of the debate, albeit very belatedly. Some have speculated the BoJ is feeding such discussion to help them to make the switch to a more normal policy, though that suggestion is a contradiction to recent comments from Governor Kuroda to the Japanese government, and lacks much real support. ING international Survey December 2015. The ultra-loose monetary policy of the SNB is likely to continue for quite some time. Since the first quarter of 2015, the target range for the 3-month Libor has been kept between -1.25% and -0.25% and the interest rate on sight deposits with the SNB remains at -0.75%. We believe rates will be kept at these levels until the first quarter of 2020, where we could see a rate hike of 20 basis points. However, there's a chance the first rate hike may be postponed still further. Why is the SNB so cautious? After all, the Swiss economy is doing very well, with GDP growth expected at 3% in 2018 and inflation finally starting to rise (1,1% in October). But, at the same time, the SNB is trying to stop the Swiss franc from rising too quickly. The franc has been gently strengthening in recent months and the SNB still considers it to be 'highly valued'. 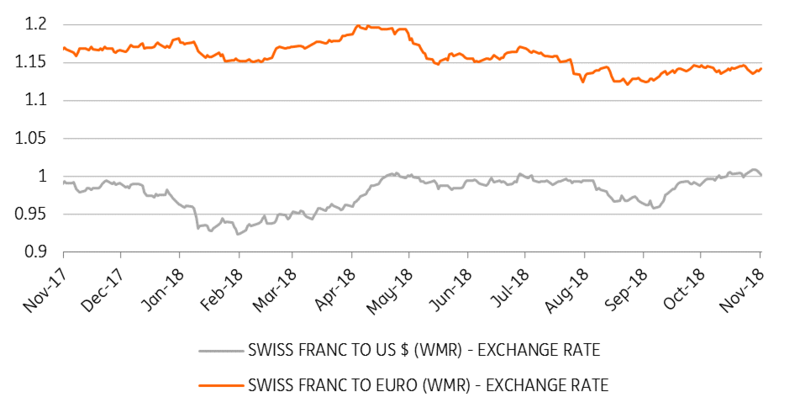 The Swiss franc is, of course, traditionally seen as a safe haven currency and risks to European growth, Brexit, the Italian budget, trade wars and market volatility are all some of the 'known-unknowns' which could contribute to it strengthening further. That’s why we believe the SNB will not increase its rate before the ECB hikes first. We think the SNB will remain extremely dovish in its statement after its December monetary policy meeting. We believe the SNB will strongly emphasise the appreciation of the Swiss franc in recent months and will still describe the CHF as “highly valued". The SNB described the Franc as "highly valued"
For much of 2018, Norges Bank looked to be on a steady path towards ever tighter policy. It revised up its interest rate forecast in both March and June, and duly delivered with a 25bps hike to 0.75% in September. But despite the first rate hike in seven years, the September meeting actually marked a shift towards a more cautious stance. Against expectation, the NB revised down its interest rate path for 2019, removing the potential for three hikes in 2019. The key reasons were a reassessment of domestic growth momentum and concern about the impact of higher rates on the highly indebted household sector. On the domestic growth side, we still see solid momentum into 2019 as the post-oil slump recovery continues. There is some upside risk to the NB’s fairly conservative forecasts for wages and inflation. But the recent sharp fall in the price of oil, most of which has come after the NB’s latest meeting, is bad news for the Norwegian economy, as is the weaker growth momentum in key trading partners such as Sweden and the Eurozone. A weaker external environment may be partly offset by krone depreciation. The NB’s forecast assumes a ~5% appreciation from current levels to the end of 2019. So krone weakness resulting from a poor risk environment pushes up on the NB’s interest rate forecast, neutralising some of the downside news from other factors. 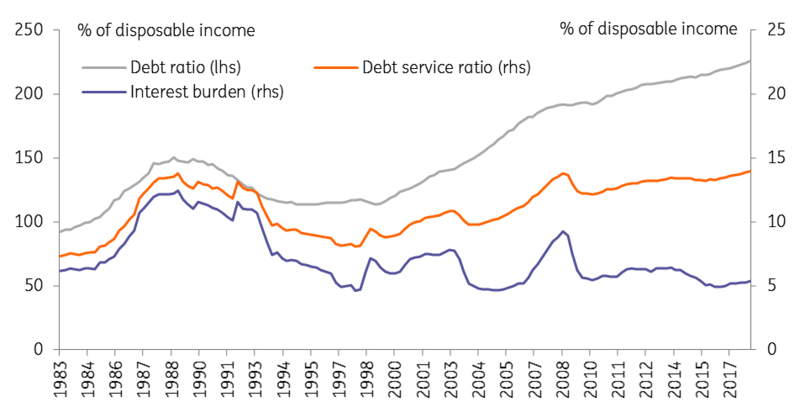 High household indebtedness is more of a structural issue and something that will affect the policy outlook for the foreseeable future. Household debt amounts to more than 100% of GDP in Norway, or more than 200% of households’ disposable income. That is very high compared to previous periods and to other countries. Given that a large share of Norwegian mortgages are on variable or very short-term fixed rates, the impact of rising interest rates is considerably higher than in the past. On balance we think the NB remains just about on track to keep tightening policy in 2019 and we still expect two hikes (in Q1 and Q3). But the bar to raising rates faster is quite high, so the risks are mainly to the downside. If the global economy slows and especially if the oil price falls further in 2019, this could push the NB towards a slower hiking path. Sweden's Riksbank is finally getting close to the elusive first rate hike. But with the domestic economy slowing, core inflation still weak, and the global backdrop increasingly worrying, the ultra-cautious Riksbank governors will continue to tread carefully. Two key developments this year have been persistent downside surprises and the weakness of the Swedish housing market. Both are likely to weigh on the outlook for 2019. On inflation, the Riksbank’s forecasts this year have been consistently too optimistic, with eight out of ten monthly data points weaker than expected. The underlying issue is that wage growth has remained modest (2.6% in the latest reading), which is unlikely to change until the next round of union negotiations in 2020. The krona depreciation this year (the KIX index has fallen by around 5% in 2018) will boost inflation over coming months, but that effect is temporary and we see underlying inflation as likely to remain anaemic over 2019. On the housing market, prices appear to have stabilised since the sharp falls at the end of 2017 and early 2018. But new constructions has slowed considerably, and household consumption also appears to be negatively impacted by housing market uncertainty. Combined with a weaker outlook for the Eurozone, this means lower growth in Sweden for 2019. In September, the Riksbank committed to hiking rates by 25bps in either December or February. 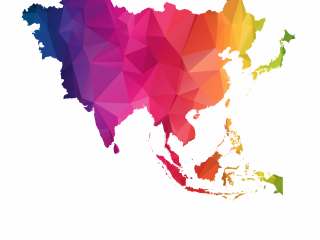 We think mixed data and the increasingly worrying global backdrop is likely to push policy-makers towards the February option. But having given such an explicit commitment to hiking, it would take significant downside news to prompt a delay beyond February. Whether the first hike comes in December or February, we expect the Riksbank will seek to soften the impact by shifting the interest rate forecast down somewhat and perhaps also committing to further reinvestments of QE portfolio (a decision that in any case needs to be taken by April). Further out, the picture looks tricky for the Riksbank. 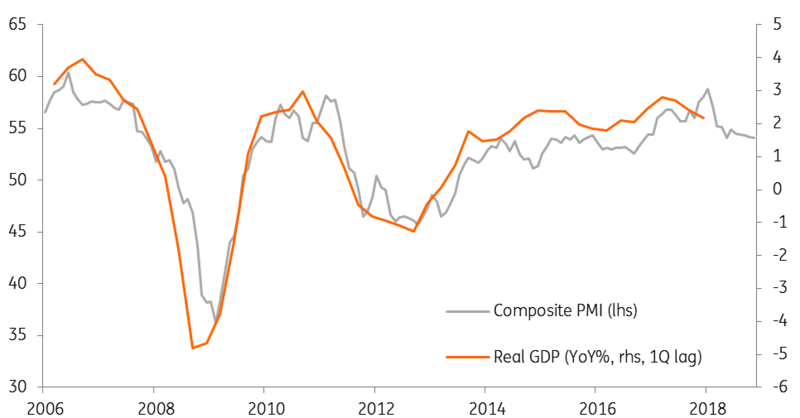 The domestic economy is clearly slowing, and the global outlook is increasingly murky as well. In this environment, the Riksbank will find it difficult to normalise interest rates. We expect at most two hikes by end-2019, and see the risks, therefore, look skewed to the downside. The Bank of Canada hiked rates for the third time this year in October, and this won’t be the last; they will remain in policy normalisation mode in response to the economy operating close to potential. 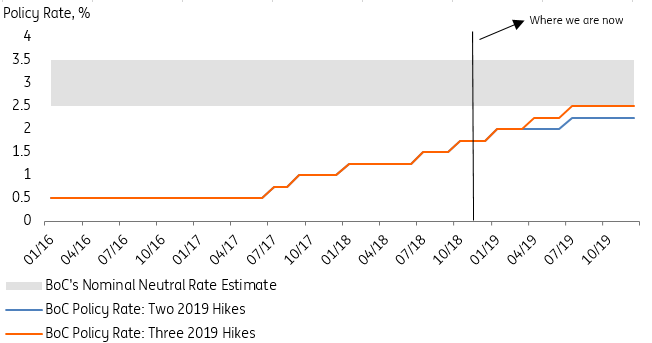 We predict two hikes in 1Q19 and 3Q19, taking the rate to 2.25% - near the BoC’s estimate of the nominal neutral rate (2.5%-3.5% based on at-target inflation). And we aren’t ruling out a third. The bank’s hawkish tone at the October meeting suggests they’d probably like to bring the rate to 2.5% by end 2019. But we see this contingent on downside risks subsiding; wage growth is weak, house prices are moderating and the large household debt/income ratio still lingers. It would be naïve to not consider global risks too. The US-China trade spat, a hefty differential between WCS and benchmark oil prices and Canada’s flattening yield curve. Together these risks should keep the BoC tentative on a third hike. That said, despite concerns over the Bank's tightening plan, good growth, relatively low unemployment and near-target inflation, it still leaves us confident to price two 2019 hikes in – for now. Australia’s economy continues to send out mixed messages. The latest labour report, which is always prone to some shocks and should be treated with care, suggested a return to very strong full-time employment growth. The unemployment rate also remains low, and wages have begun to show early signs of bottoming out. All this should be putting the Reserve Bank of Australia (RBA) on hike alert. The RBA will also have taken heart from a small, but perhaps significant acceleration of hourly ordinary time wages growth, though the rate remains low. Inflation too remains very benign. At 1.9%YoY, headline inflation is no threat to the 2.5% mid-point of the RBA’s 2-3% target range. RBA Governor Lowe seems to have few worries about inflation, and his message remains very dovish. Lowe sees the unemployment falling a further half percentage point before wages growth accelerates sufficiently to warrant higher rates. And he is also concerned that lending standards at banks have become too tight (something you can presumably blame APRA, the regulation authority, for rather than the RBA), and also the increase in market rates which have been passed on by some banks in terms of higher lending rates. Lowe also seems to be taking declines in the housing market more seriously than in the past, though for now, his view seems to be the relatively positive one that having enjoyed considerable paper and liquidity benefits from earlier house price growth, a little retrenchment should not throw consumer spending under the bus, especially while the labour market remained strong. Still, the fact that Lowe gives housing more airplay than in the past suggests that it is higher up on his risk watch list than in the past. Lowe seems to feel that the next policy move the RBA makes will be to raise rates. “If the economy continues to move along the expected path, then at some point it will be appropriate to raise interest rates,” he said. But this might not be for a while yet “There is a reasonable probability that the current setting of monetary policy will be maintained for a while yet,” Lowe said following the recent RBA rate-setting meeting. Market expectations of RBA tightening have moved higher following the last labour market report. But given future risks, a much flatter outlook is probably more likely and it would only take a labour report miss next month, or some more disappointing inflation or wages data, to push thoughts of the next RBA move even further out or flip it to a cut. Possibly because RBNZ Governor, Adrian Orr, has been so downbeat about the prospects for a rate rise in New Zealand, recent labour market data has taken markets by surprise. As a result, the end 2019 bank bill future implied rate is 10bp higher than it was a month ago, making an end 2019 hike about an 85% probability according to some market estimates. More than the chances of an RBA hike by the same date. Mr Orr doesn't seem to agree, suggesting that rates remain on hold through 2019 and 2020, and at the last press statement, earlier this month reiterated the existence of downside as well as upside risks to their assessment. All of this comes about because of a few bits of labour market data. Firstly, the unemployment rate dropped in September by an implausibly large 0.5pp to only 4.4%, not far off the all-time low of 3.3% at the end of 2007 beginning of 2008. But not only that, wages too grew by 1.4% in 3Q18, from the previous quarter. In annual terms, New Zealand ordinary time wages growth is now running at 3.6%YoY. 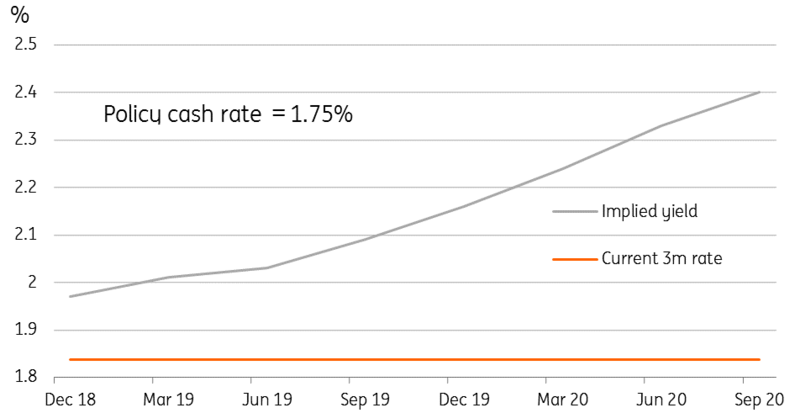 Aside from the pre-crisis peaks of wages, this looks like a pretty normal rate of wages growth for New Zealand and perhaps argues for a more normal looking RBNZ cash rate. The other newsworthy RBNZ events surround proposed changes to RBNZ legislation, which would provide a US-Fed-like dual mandate of maximum employment and price stability, together with a BoE-like Monetary Policy Committee composed of both inside RBNZ officials and outsiders. The first decision under the new mandate could come as soon as March next year.